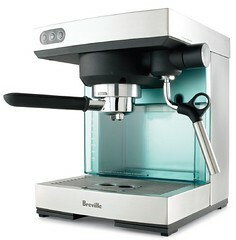 Enjoy café quality espresso in your own kitchen. 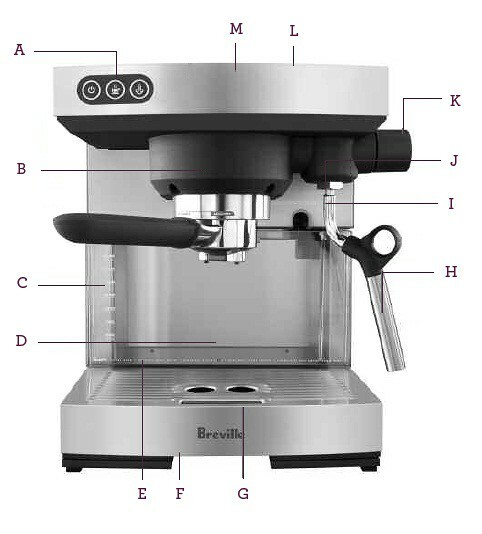 The Breville® BES400XL ikon Espresso Machine boasts commercially inspired features and a striking design formed in stainless steel. With the Triple Prime feature for gently expanded grounds, a stainless steel boiler system for precise temperature control and an exclusive Easy Eject filter system that allows for the easy removal and exchange of filters, it’s everything you could want in one small beautiful package. A. Electronic Touch Controls. B. Stainless Steel Boiler Heating System. C. Removable 2 Liter Water Tank. D. Extra Large Cup Height. E. Tool Storage Tray. F. Removable Drip Tray. G. Water Level Indicator For The Drip Tray. H. Froth Enhancer. I. Pre-Brew Function. J. Commercial Size Steam Wand. K. Variable Steam Control Dial. L. Extra Large Cup Warming Tray. M. Stainless Steel Design. Not Shown Stainless Steal Frothing Jug and Measuring/Tamping Spoon.